Apr. 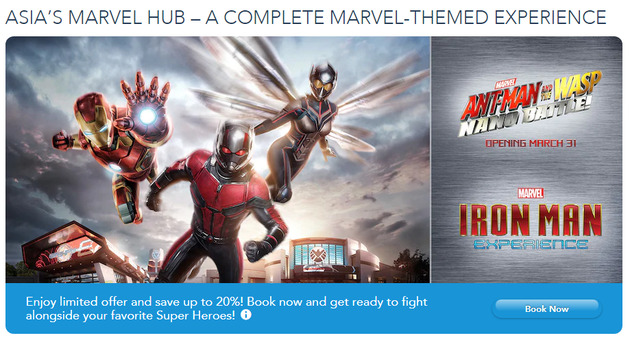 2 (NBD) -- Hong Kong Disneyland Resort takes a new step towards being Asian base for Marvel's superheroes as the newest Marvel attraction–Ant-Man and The Wasp: Nano Battle! - was open to the public on Sunday. Guests of the opening ceremony last Thursday included Ant-Man's actor Paul Rudd, Marvel Studios president Kevin Feige, Marvel Entertainment's chief creative officer Joe Quesada, Ant-Man director Peyton Reed, producer Stephen Broussard, and actress Jessica Hsuan, who plays Hong Kong-specific Marvel character Leslie Lam, the Chief Engineer of the S.H.I.E.L.D. Science & Technology Pavilion. The facility expands the epic adventure of Iron Man Experience, offering a Marvel-themed experience with first-of-a-kind attractions, themed-merchandise, and food and beverage. Visitors will participate the battle alongside Ant-Man and the Wasp while being shrunk down to the size of an ant. This is the second Hong Kong Disneyland Resort attraction based on a Marvel property. On January 11, 2017, 3-D motion simulator attraction Iron Man Experience made a debut in the park, the first tie-up between Disney and Marvel in amusement facility. "Marvel stories have always been a hit with guests around the world, and we believe this project will enhance the attraction of Hong Kong Disneyland and bring together guests of all ages," Stephanie Young, managing director of the resort. Marvel-themed entertainment contents are deemed as a performance boost by not only the Hong Kong resort but Disneyland in Shanghai. Unlike the Hong Kong park that focuses on bringing interactive adventures to tourists, the Shanghai resort makes more efforts in hosting Marvel-related events. Marvel Studios celebrated the 10th anniversary of the Marvel Cinematic Universe in Shanghai Disney Resort on Aril 19 last year, welcoming Robert Downey Jr., Mark Ruffalo, Tom Holland, and Tom Hiddleston, actor of Iron Man, The Hulk, Spider-Man, and Loki, which trended on Chinese social media Weibo. This year, Marvel announced the promo art event of Avengers: Endgame is scheduled to be held in Shanghai in mid-April with Paul Rudd, Chris Hemsworth, Jeremy Renner and other "avengers" in attendance. Industry insiders observed that since Shanghai Disney Resort started operation in June of 2016, the two theme parks severally situated in China's southern and eastern area inevitably clash with each other when vying for customers. The upsurge and downturn of Shanghai resort's passenger flow are seen coincide with Hong Kong Disneyland's trough and rebound, respectively. In the financial report for the first quarter of 2019, Shanghai Disney Resort generated lower operating income primarily due to lower attendance and higher costs, in contrast to an increase in operating income Hong Kong Disneyland Resort posted which was driven by increased guest spending and higher occupied room nights. Senior tourism expert Wang Xingbin noted that the positioning of the two parks has begun to differ. The Shanghai resort's targeted consumers are mainly families and children tourists, while the Hong Kong park is more oriented towards adults. Both Disney branded tourist attractions could develop projects and events based on similar or even the same intellectual property resources, yet in the long run, complementarity between them will be unfolded as the parks adopt differentiated strategy of growth.